My trusty Mrs Sat Nav brought me to the door of the Finchley (North London) Trinity Church Centre. Finding non-residential parking was more difficult but a two-minute drive and I got the last space down the hill, which meant a nice refreshing walk. I was over an hour early so had a cup of fruit tea and a banana (having resisted a nice array of cup cakes). With the speakers tucked away in one of the side rooms, I didn’t get to speak to them, although I did get a quick chat with crime novelist (and interviewee) Leigh Russell as she came in – we’ve met in real life a couple of times – but I was happy sitting in the foyer as I got to see the comings and goings, plus for the first few minutes we were serenaded by a chap playing the piano! The venue itself felt very church-like with its arched doors and small step up to the speaking platform. There was plenty of room with about fifty chairs, most of which were filled, and it felt very much like being in on the beginning, albeit it their second year, of a literature festival with great potential. The man previously playing the piano, Mike as it turned out, gave a two-minute warning and a few people originally in the foyer joined us, followed by the guest authors and we were soon underway. The event kicked off with a short welcome from Mike, another organiser Lindsay Bamfield, then her colleague, Rosie Canning, explained that the theme for the festival was ‘Truth and Fiction’. She then introduced C J (Chelsea) Flood. 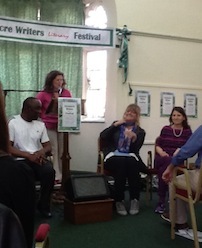 CJ gave a synopsis of her book, Infinite Sky, then read out an extract featuring the main character Iris and her father. CJ explained that she started the book before she started her MFA at The University of East Anglia, and added that there was a lot of her father in the character’s father. Her real parents had split up as they do in the book but the mother is very little like her real mother. She then read another extract including the mother. There is a love interest, played by a young male traveller, which CJ said was a composite of some of the men she’s known thus far. A final extract was still from the daughter, Iris’, point of view but CJ did say that while she’d originally written the character Sam based on her brother he became less and less like him. One of the extracts (from Chapter 11) started ‘When we’d eaten more pancakes than was OK…’ which I loved. The writing was very descriptive and you could imagine yourself being there which is what good writing should do. 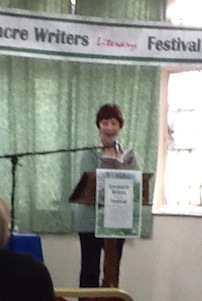 Leigh Russell was then introduced, citing accolades from Jeffrey Deaver and Peter James. She started by telling the audience how she came to be a writer. She was walking through a park on a grey day and saw a man who made her feel uneasy then talking about seeing a hand sticking out of a bush. She then admitted the hand wasn’t there in real life but it gave her the idea for the story. Several men have since claim to have been that man(!). Leigh then wondered who the girl (belonging to said hand) was? Her boss would have missed her. Maybe she had a boyfriend who beats her up and is a suspect. Leigh’s first five books have two-word, two syllable titles but then they struggled with the sixth which is still a two-word title but with two then one syllable. 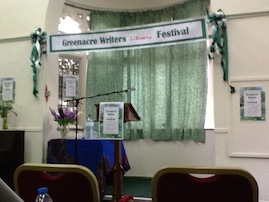 There were then four readings from Greenacre Writers members staring with Lindsay Bamfield who chose an extract from her fifty-something-Bridget-Jones-type novel which was set at a speed dating and very funny (and having written a forty-something-Bridget-Jones-type novel, I was paying particular attention). Lindsay then introduced her co-writer Linda Dell and listed a variety of publications; short stories, seven books including self-help and novels. Linda read from an abridged chapter one of a children’s science-fiction story. Rosie was next reading an extract of her story about a girl who could fly. 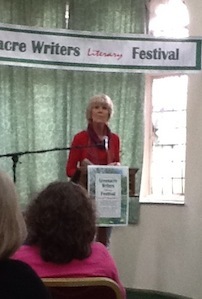 She, in turn, then introduced Mark Kitchenham. Mark admitted he’s a beginner and submitted the first draft of his novel to Cornerstones Literary Consultants who said it had potential despite Mark having written it as one long piece of prose because he thought line breaks a waste of paper, which made us all laugh. Mark read out an abridged short story set in First World War Poland with the main character as a young girl hiding with her parents. Although I’d not experienced anything like it, it was very realistic and well-written. We then had a break for half an hour during which we could buy refreshments and signed books! 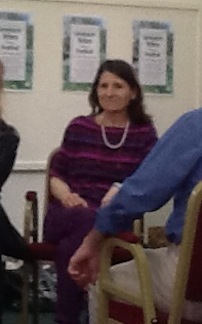 Lindsay then introduced Gina Blaxill who is a “local girl” and writes crime novels for teenagers. She compared her writing with her brother’s thesis which has loads of footnotes and nonfiction information. She said that although she can do crazy things in her writing, she has to be truthful up to a point, especially emotionally. In early drafts she had a girl go missing but she would have been seen on CCTV at a train station. She wanted another character hiding out in Liverpool Street Station but Gina’s parents then told her that the station wouldn’t be open 24 hours a day so she phoned the station asking questions about their cleaning. Another location is Heathrow but Gina is scared of flying (I’m not a fan) so had never been. She went along to take photographs, expecting to be suspected of being a terrorist, but no one paid any attention. Gina added that she wants her writing to be accessible by young adults and that everything should feel real, the characters emotionally true. She said that YA hard to write for because of their life knowledge. Her audience is very smart and doesn’t want to be caught out. She wanted to know about technology so she reread her childhood crime books which had instances where they would now have used mobile phones. Gina then read an extract from her second book, Forget Me Never, and afterwards added that someone had told her that once home, family or friends are threatened, it is the end of the character’s world and great motivation to defend them. She then summarised her first novel, Pretty Twisted, and read an extract from it. The main character was comparing herself to her older sister and made a really interesting comment that they shared they the same eyes, nose and mouth yet they were very different (her older sister prettier so she pretended to be her when she was chatting to a guy online). 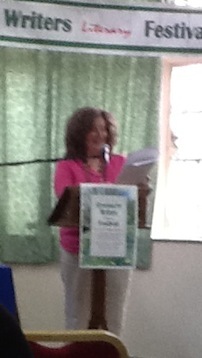 Rosie then introduced Sarah Harrison (pictured). 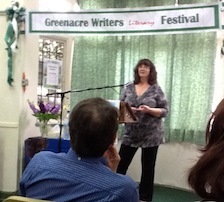 As Leigh had, Sarah thanked the Greenacre Writers Group and said how much she had enjoyed the talks by Gina and CJ as she assists a Young Writers group. Sarah recommends not writing what you know because we need identification, what we know all about keys us into the characters, and is why romantic novels are so popular. There are different kinds of love, ambition and place, and along the way there will be drama, jealousy etc. Sarah went on to talk about how often people say they don’t think a film was like the book because the story will be seen differently for each reader. Sarah said authors need to research but then only pass on small amounts to the reader although she admitted that she put too much into her early books (which I got the impression a number of the audience had read and really enjoyed). Sarah said she has to work just as hard now despite having the same publishers since 1980. She usually starts writing early and will often find she’s written a page without really knowing it. She then read an extract from Flowers of the Field. 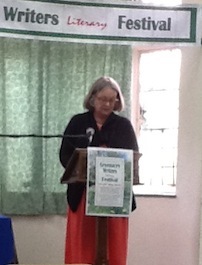 Lindsay then introduced the first of three more Greenacre Writers, Liz Goes. Liz explained to the audience that she had wanted to write an autobiography but then ended up fictionalising it and it had grown to three books rather than one. She then read an amusing extract from her third book, Not Quite An English Teacher. 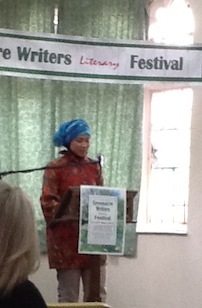 Rosie then introduced Indonesian writer / group member Mumpuni Murniati who read out her short story ‘The Drawing’ which was so well written you wouldn’t know that English was her second language. Lindsay then introduced Wendy Shillam who publishes her novella in segments on her blog once fortnight, and compares growing plants to writing: she said needs a deadline because plants have to be sowed at a specific time so she has to be as strict with her writing or they (it) wouldn’t be ‘planted’. I know that feeling (NaNoWriMo and Story a Day May). Lindsay introduced Alex Wheatle as judge of the short story competition which closes end September and the winners announced in November. Rosie then introduced the panel (Sarah, Leigh, Josie, Alex and the moderator Allen Ashley). Allen starting by asking Leigh about truth in fiction. She says she does a lot of research; about the police (she knows which station sells banana bread for example), market holders (banana boxes most sturdiest) – whatever the book requires because crime writing has to be more believable than many other genres. Josie said there is a difference between truth and fact and that she had fictionalised her life. Alex then said that JRR Tolkein had fought in the First World War and that there is a comparison in The Lord of the Rings and that most writers can put a lot of themselves into their writing, especially their first two or three books. Sarah mentioned that she’d written a book for Mills and Boon but she hadn’t stuck to their guidelines and so they didn’t publish it. Alex said readers need to have characters they can believe in and / or relate to and quoted the recent account of the man, Ariel Castro, in America who had three women in his basement for over ten years. Allen asked what must we do to stay true to ourselves? Sarah said writers should stick with their voice, not write what we think should be written, and be consistent. Leigh added that writers should write to the best of their ability and she rewrites endlessly. Writers should take their readers on a journey, saying that stories by writers like Kazuo Ishiguro are so well-written that she enjoys the writing and is not so fussed about the plot. Sarah disagreed and said she’s read stories that are not so well-written but is hooked on the story. I’m more in Sarah’s camp (sorry again, Leigh!). Alex said he’s reread The Great Gatsby and wondered if the book would have been published these days because the characters were all so horrible. Personally, I love horrible characters but yes, if they’re all horrible then probably not because we have to root for at least one of them. Allen then opened the topic of autobiography – how important is exact truth? Leigh said she had not delved in that area of writing but wouldn’t write something that offended people who are still alive. Josie added that Gulliver’s Travel was sold as truth. Sarah told the audience that she had recently read Rupert Everett’s and Jeanette Winterson’s autobiographies and although she preferred Rupert’s they showed two insights into two interesting lives. Alex said he learned more about life from reading fiction (I’m definitely more of a fan of fiction). Leigh concluded that in crime fiction there has to be some sort of moral order that will be realised by the end. It’s a way of playing through our fears because it’s not real. Allen then invited questions and a lady asked Sarah to explain more about what she meant by a moral centre. Sarah explained that if someone suddenly becomes immoral, you must have previously seeded it or it won’t make sense that they change so dramatically. Allen quoted Kurt Vonnegut, saying that you have to give the reader a character you can root for and I agree completely. Following on from what Wendy had said about writing a male character, the panel was then asked about writing outside your gender. Allen said that he only writes as a woman in short stories, anything longer would be from a male pov. Leigh talked about writing new series from Ian’s pov saying that she will do lots of research including getting her husband to help. Leigh came back with that you could shadow a lawyer, as she does with the police, and that she doesn’t want to use stereotypes when describing what men do. Wendy concluded the topic by explaining that her character has worries that anyone would have so didn’t have to go into too much detail. Mark then asked the panel whether they’d ever received critique they didn’t agree with. Leigh reassured us writers that you don’t have to agree with what you’re told, especially if you have written something for a specific purpose. 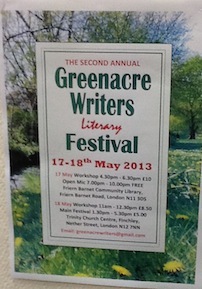 The festival then ended with thanks to the authors and fellow members of the Greenacre Writers. Apart from the parking issues, and the armed chairs being a little too snug for my writer’s bottom (thank you Jane Wenham-Jones for creating that term! ), the venue was great although I can see it outgrowing as it gains in popularity. Let’s hope so! Do you write short hand or something? How in the name of Jehovah did you remember all that? I’m very impressed. 🙂 Thank you, Mark. I did do shorthand at secretarial college but failed miserably. It was all down to my iPad and fortunately quick typing. An insightful piece, which reminds me great things about the festival. Kudos to you! Thank you very much. It felt very special to be a part of it. Thank you for the write up. I’m now calling our festival little-but-mighty. I was so busy thinking about the logistics of ‘what next’ during the event that I had occasional lapses of concentration so thank you for filling in the gaps! It’s a great write up. Glad you enjoyed the day. I’m only just coming down off the high, or do I just mean recovering? What a shame, Vikki. If I’d known you were nearby, I would have loved to meet up. It was listed on https://morgenbailey.wordpress.com/events but don’t know how many people check it. So detailed, makes me feel like I was there! I’m glad I found your page, and I’m intrigued by your different online writing groups. Thank you very much, Emilia. I love the smaller festivals because you get to meet more people and it’s a great intimate setting.